French tip nails are classic designs that have stood the test of time. The core idea of the French manicure is painting the tip of the nail in a color that either complements or contrasts with the base color. These new ideas for 2018 present many different sides to the French tip manicure. Combining different manicure types makes nails stand out, as does a variety of nail art techniques. Trendy polishes like gels and chrome nails are included here, along with fresh takes on the French manicure like glitter and embellishments. True nail addicts will find many pretty and fun ideas that will make their manicures stand out in a crowd. 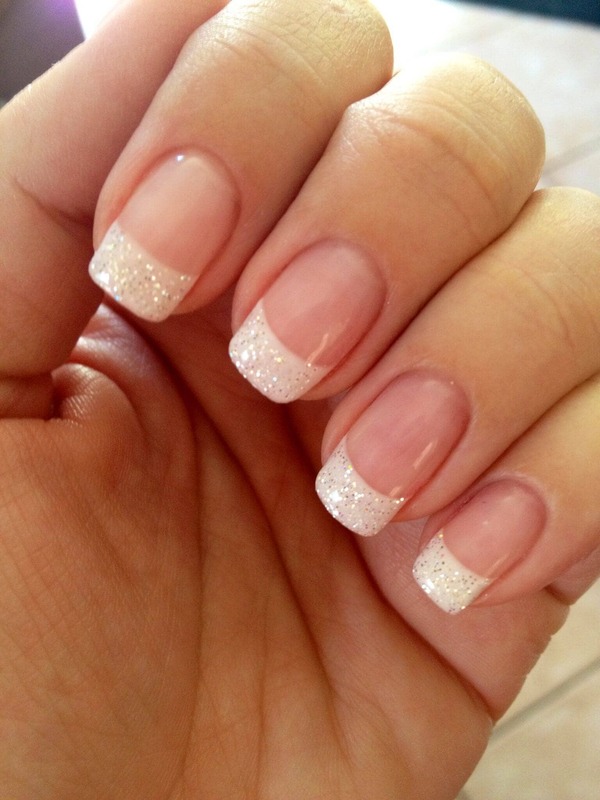 French tip nails are so popular because the basic look is so classic and elegant. French tip manicures look good on everyone from young to old. With the French tip manicure, wearers can be in touch with historical fashions or bring the look up to the moment. It’s all about the choices of polish and embellishments. It is easy to do many of these designs at home. All you need are two different kinds of polish and a steady hand. There are many ways to make your look stand out when compared to the traditional manicure. Try mixing up the colors. Start by substituting either the pink or white with a different color. You can also shake things up by mixing matte and glossy polish. Metallic polish is another way to make these looks pop. Adding nail art brings another dimension to the French tip manicure. Many of these designs have nail art on the ring fingernail to set it apart from the rest. Practice your nail art skills with a toothpick or fine paintbrush and experiment with different designs. French manicures are one of the best looks for everyone to try. any outfit from casual to formal. 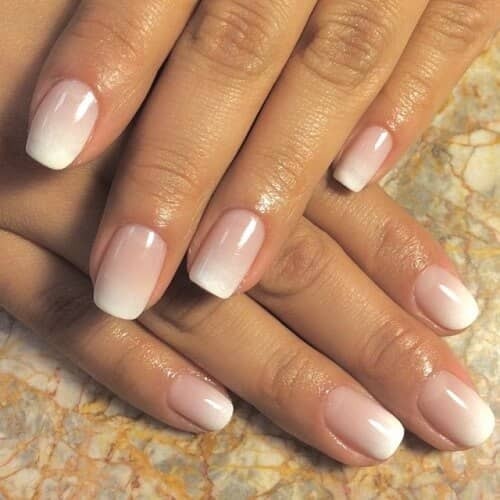 This French manicure design starts with a coat of subtle pinkish white matte polish. At the ends, there is a neat and controlled line of shining pink chrome. This updates the classic French tip manicure to fit in with today’s nail trends. This nail polish idea is great for anyone who wants a subtle but perfect touch to any outfit. Beginning with a solid coat of a glossy baby pink polish, this gel French manicure is delicate without being fussy. The tips of the nails are painted very slim for an updated look. This simple nail polish idea provides a sophisticated backdrop to the model’s jewelry. This would be a great look for a wedding or for any formal occasion. These nails are painted with an all over coat of palest pink. The white tips are painted on lightly for a fresh take on the French tip manicure. The nails are flared a bit at the tips for a different silhouette. These natural nails give the model a pretty, casual look that complements her classic style. 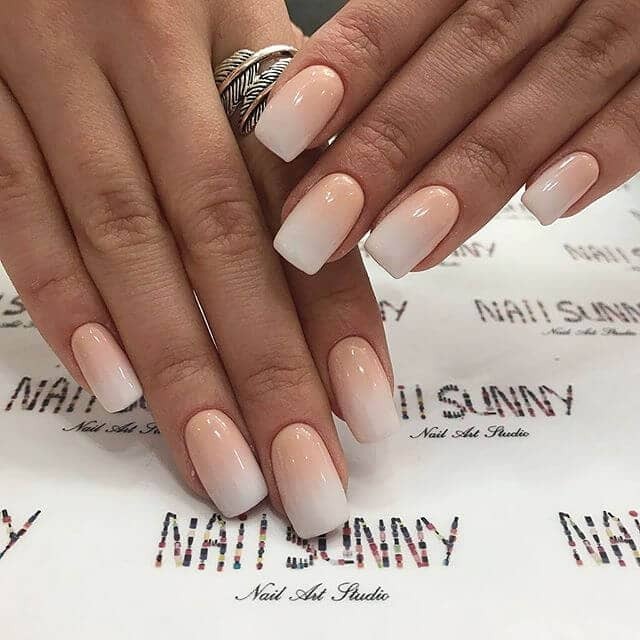 These nails have a classic oval shape. They are painted with a gentle coat of glossy baby pink. The white tips are subtle and almost blend into the pink nail polish base. These natural looking nails are perfect for anyone who wants a time-tested look that fits in with today’s nail color trends. 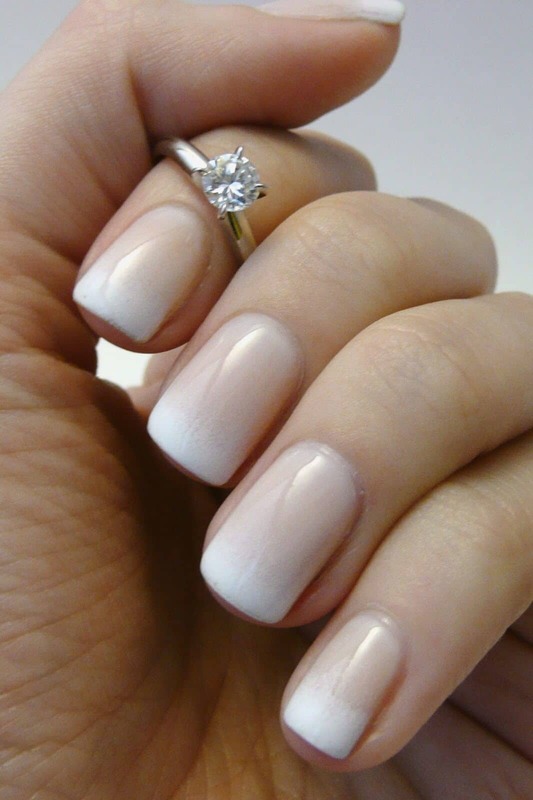 This sweet French manicure idea begins with a classic pink and white base. The tips are painted straight across for a neat look. On each ring fingernail, there is a line of subtle pink and brown cherry blossoms. This nail art is understated enough for anyone to wear. They provide a fresh and lovely accent to any woman’s wardrobe. For those who are going for a punk rocker look, this is an awesome black nail design. Two nails on each hand are done in a glossy shade of deepest black. The middle fingernails have a black base and silver glitter coat. The ring fingernails have a glossy pale gray polish with black French tips. 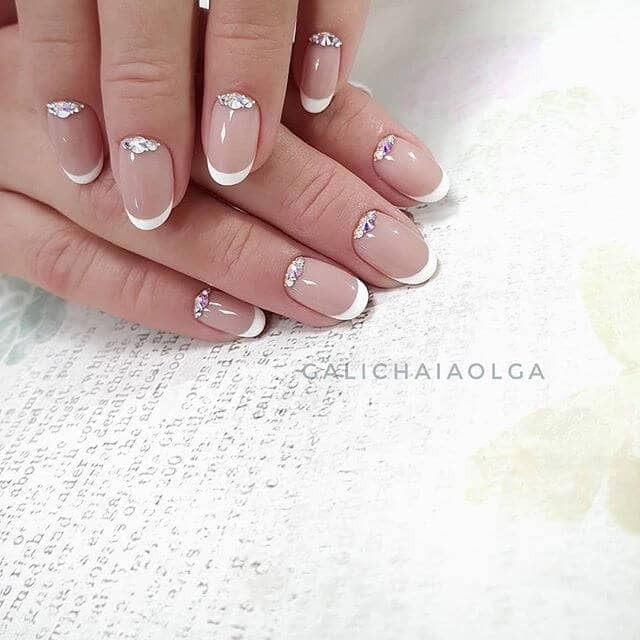 This gorgeous French tip nail design starts with a coat of glossy pale pink nail color. The tips are done in a smooth, perfectly applied gold chrome polish. This look is great for brides, bridesmaids, or anyone who wants to look like a princess. It perfectly complements gold and diamond jewelry. With a base coat of cotton candy pink and fresh magenta tips, this long nail design shows that a little pop of color can make all the difference to your French nails. These nails are worn long and squared off at the ends. This color combination is fun and youthful. 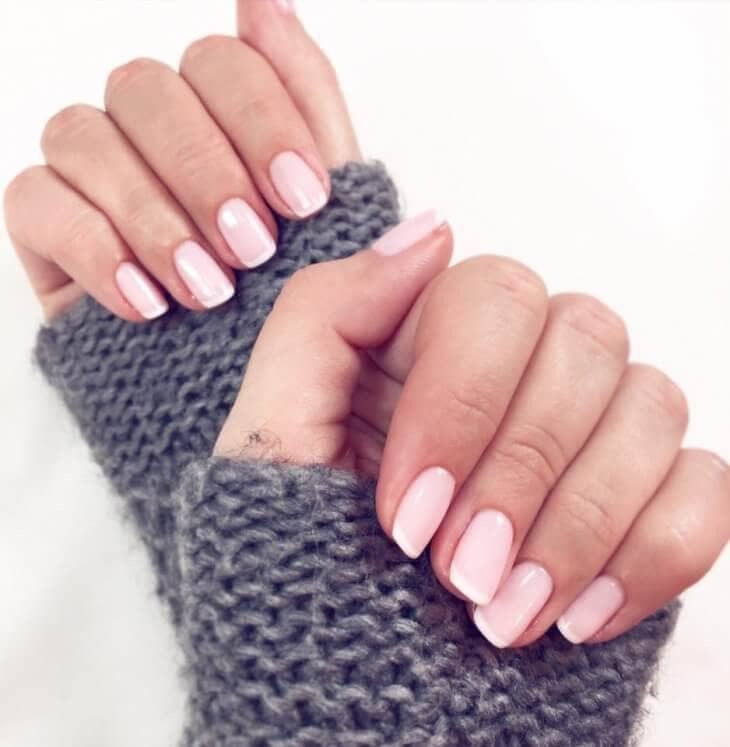 These natural looking nails start with an overall coat of blush pink gel polish. Their creamy white tips are subtly painted on. 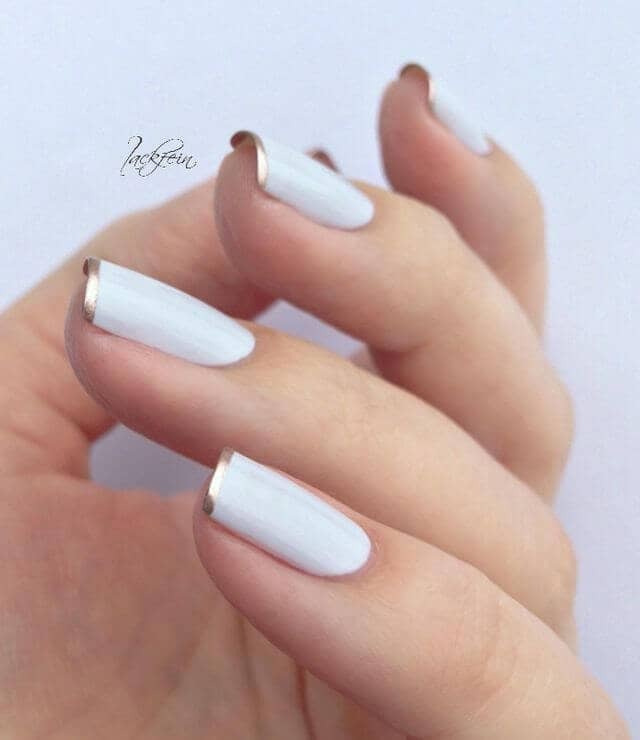 This white tip nail design is finished with the ring finger with a pretty matte textured finish. The matte textured nail provides a nice contrast with the glossy French manicured nails. 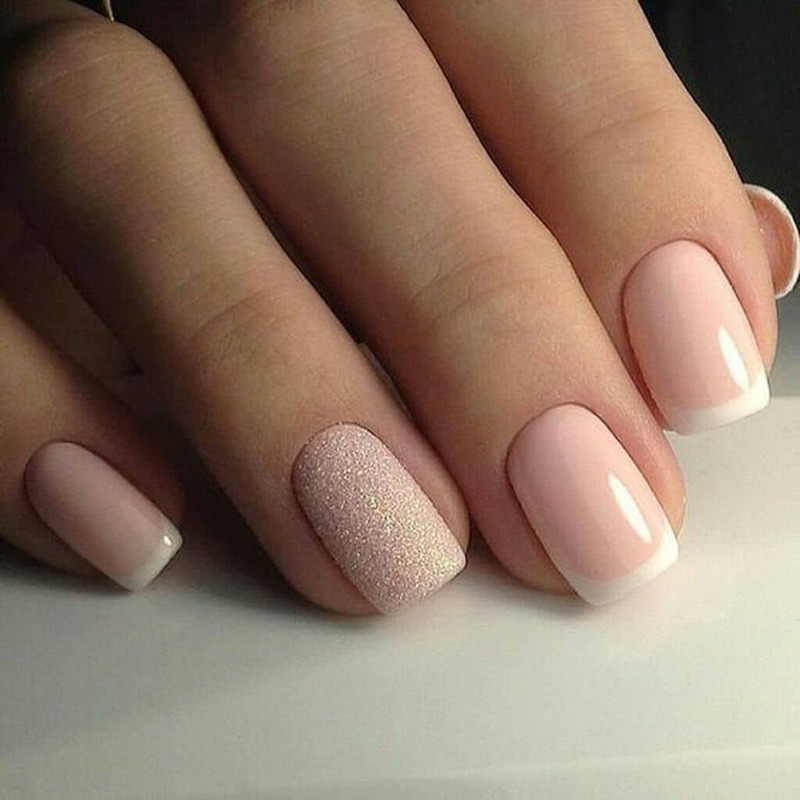 These designer nails are subtle and gorgeous. They are worn trimmed close with natural tips. 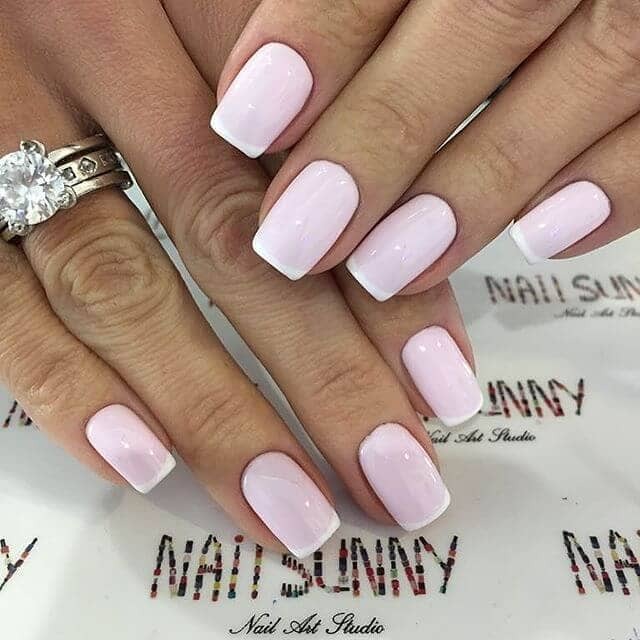 The contrast between the subtle shell pink base coat and the clear white tip makes this short nail design lovely. This cute design would be great for any occasion, from work to formal. They combine practicality with style. This creative design is a new spin on the French tip manicure. The nails are painted with an allover coat of blush pink which nearly matches the model’s skin tone. At the tips of the nails, a thick coat of glitter is painted on. The glitter gradually tapers toward the middle of the nail. 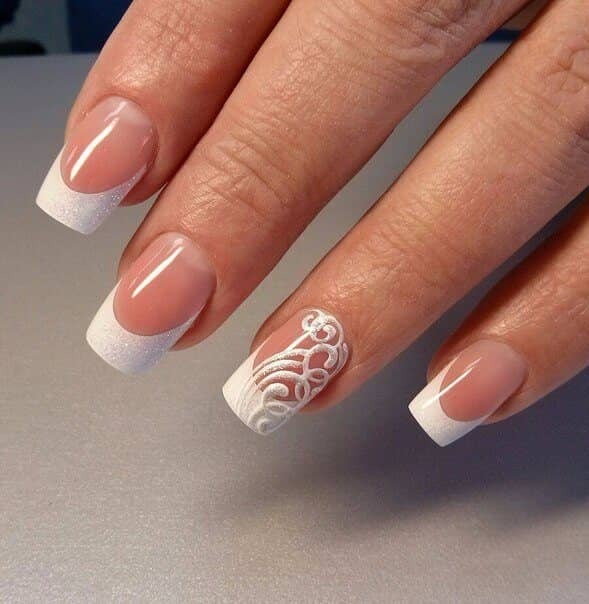 This long nail design has squared off oval tips. The base coat is a gentle shade of peachy pink and the tips are done in a fresh cream. The tips are worn longer than in some similar designs. On the ring fingers, a smooth coat of glitter finishes the look. This is one of the prettier manicure types. 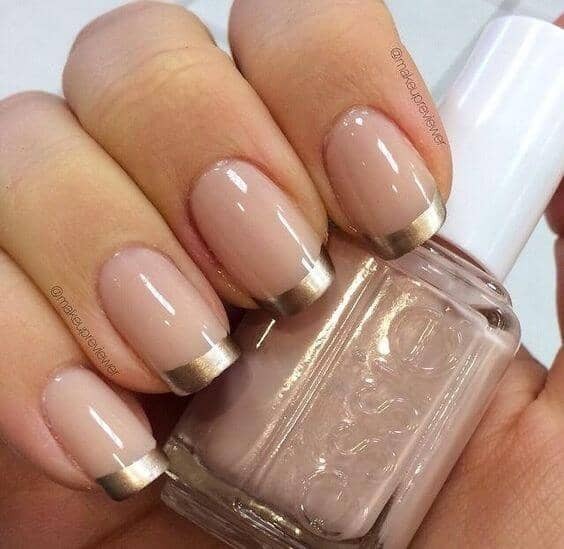 Gorgeous gold stripes accent these French tip acrylic nails. The base coat is the palest shade of baby pink and the tips are white and squared off. It’s a great idea to match features of your manicure to your jewelry, as the model is wearing. This provides visual interest to your manicure. This short nail design is a classic French tip manicure with a “squoval” shape. The creamy pale pink base coat provides a nice contrast to the soft white tips. This cute easy nail design is wearable by anyone and goes great with everything from jeans to work wear. 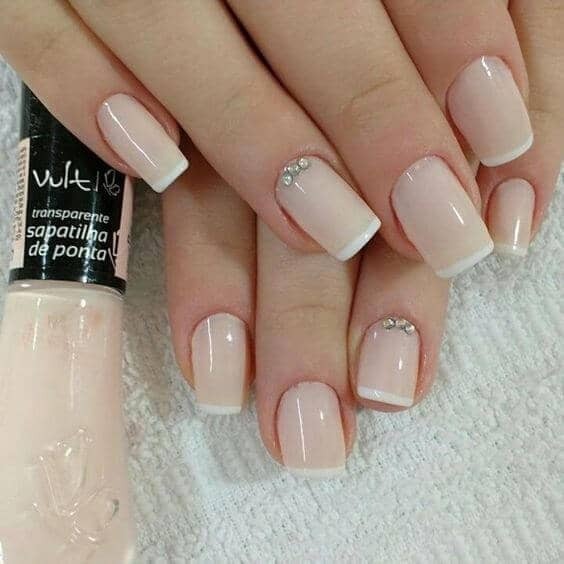 Pearly pink polish combines with white tips to create classy French tip nails. These nails are worn at a practical short length to look great on anyone. The ring fingernails are accented by a fabulous, textured all-over glitter coat. 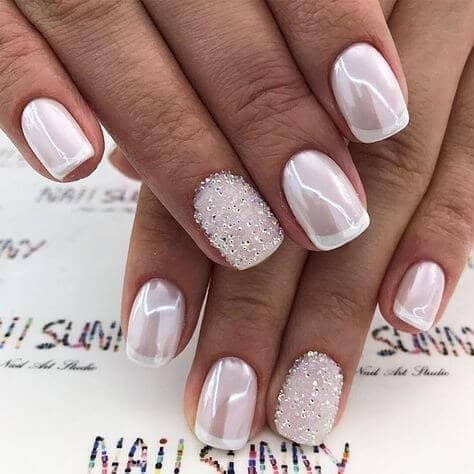 Any nail addict would love this sparkly, fresh look. 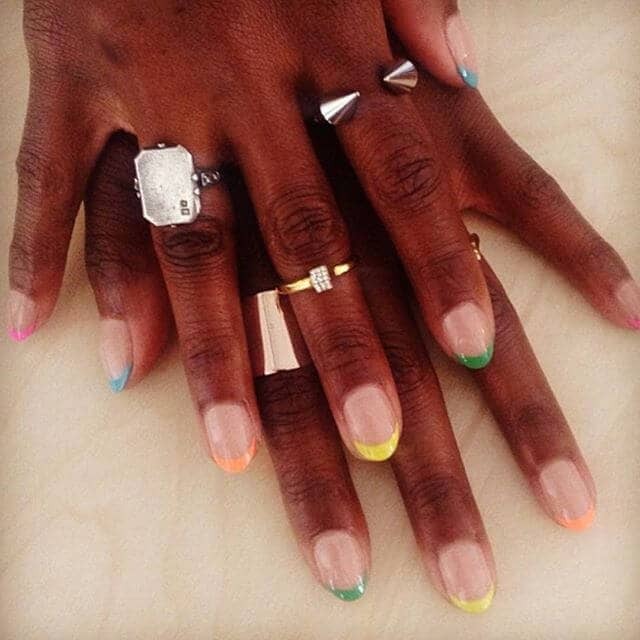 For a trip outside the usual realm of French tip manicures, try these colorful nails. This cute easy nail design starts with a pale pink base coat. 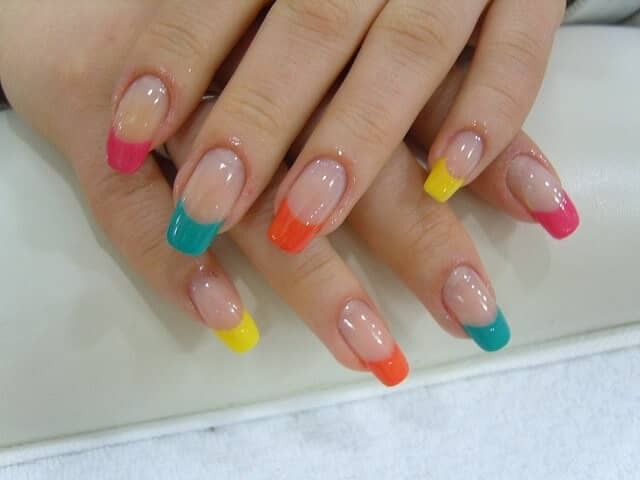 Different colors are swept on the tip of each nail for a rainbow effect. This is an example of fun-loving nail designs for all ages. 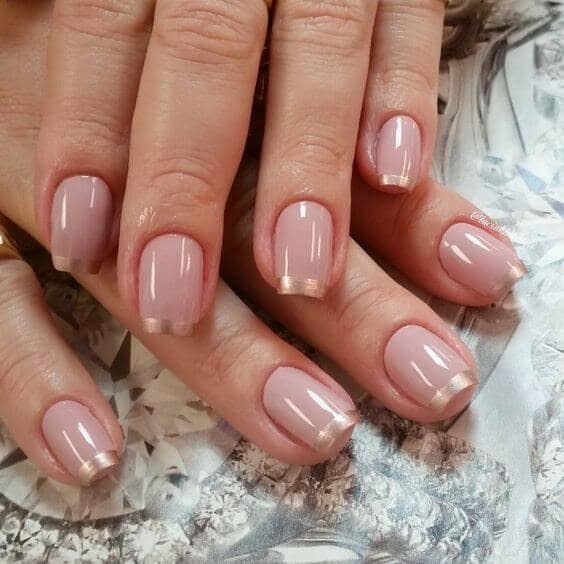 This French manicure design starts with a soft coat of pale pink. The tips are painted in dramatic swooping chevrons. This gives the nail art design a twist of drama. This classy look would complement the dressiest outfit for a night on the town. It looks gorgeous with the model’s diamond jewelry. 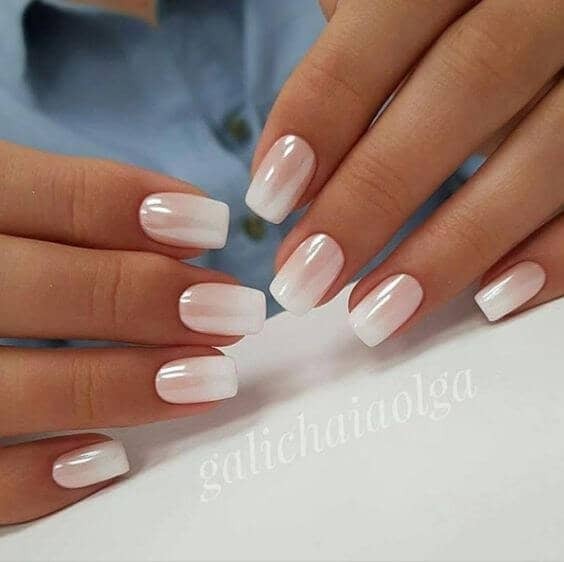 These French manicure nails have a baby pink base and shining white tips. They are worn long in the “squoval” style. 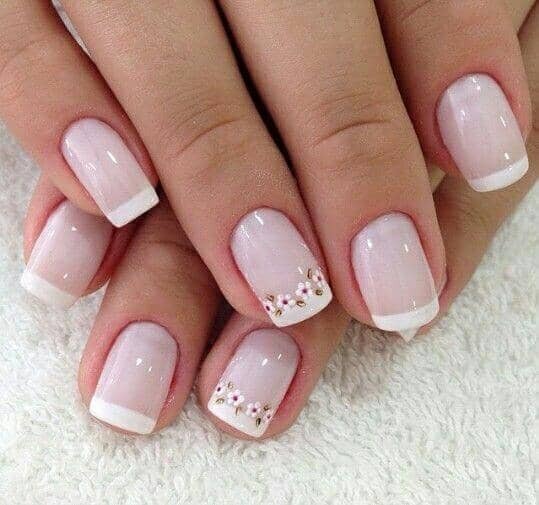 These nails are accented along the line between pink and white with little beads of silver. This is a subtle nail art design that provides a pretty complement to silver or crystal jewelry. 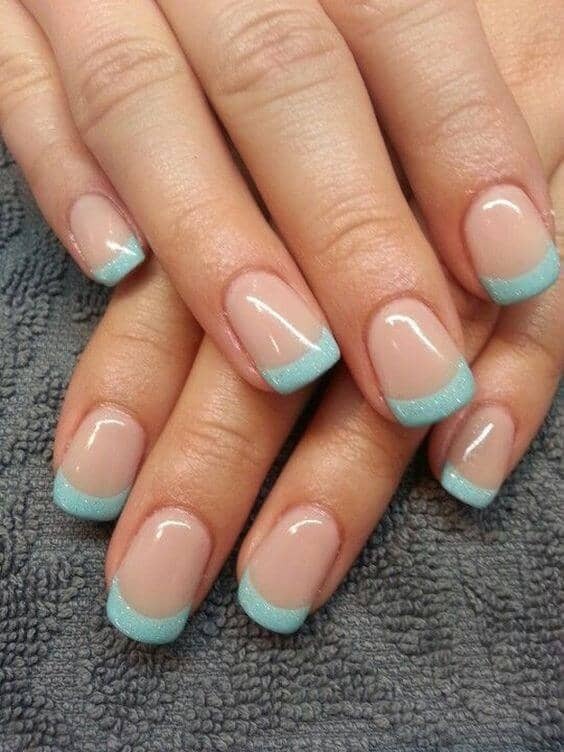 Iridescent polish highlights this cool French manicure idea. 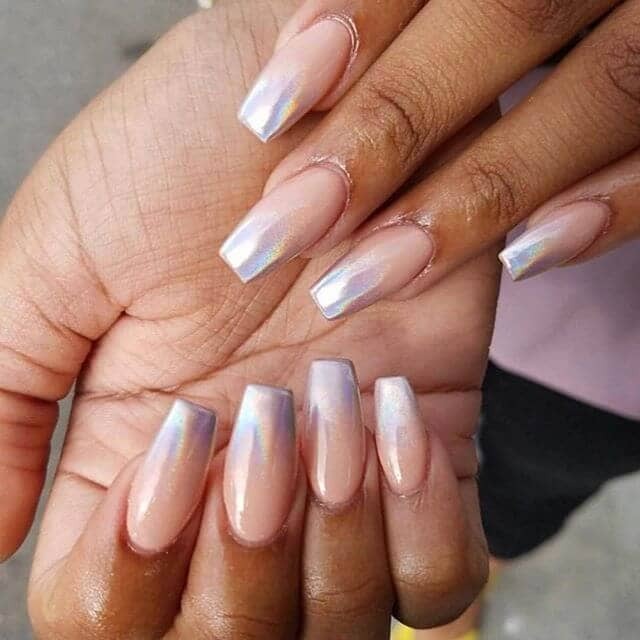 These nails have a gorgeously painted gradient between the blush pink base and the glimmering iridescent tips. This looks like a simple design on the surface, but a great deal of skill would be needed to get it right. This long nail design is squared off at the tips. A sweep of silver glitter across the tips keeps these natural looking nails from being boring. 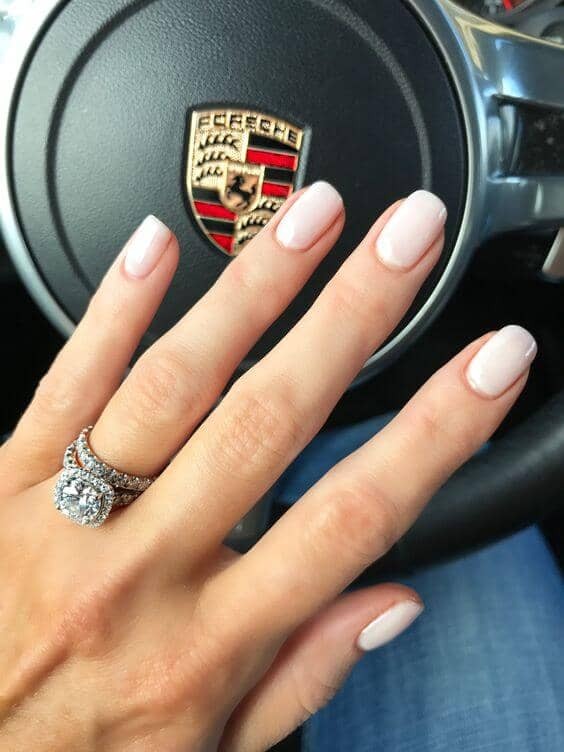 The base coat is a classic blush pink, and the tips are a soft white. This cute easy nail design would look nice on anyone. The youngest nail art lovers would especially enjoy wearing it. Super glossy blush pink polish is the base of this French tip manicure. At the tips, gold metallic polish makes an elegant accent. 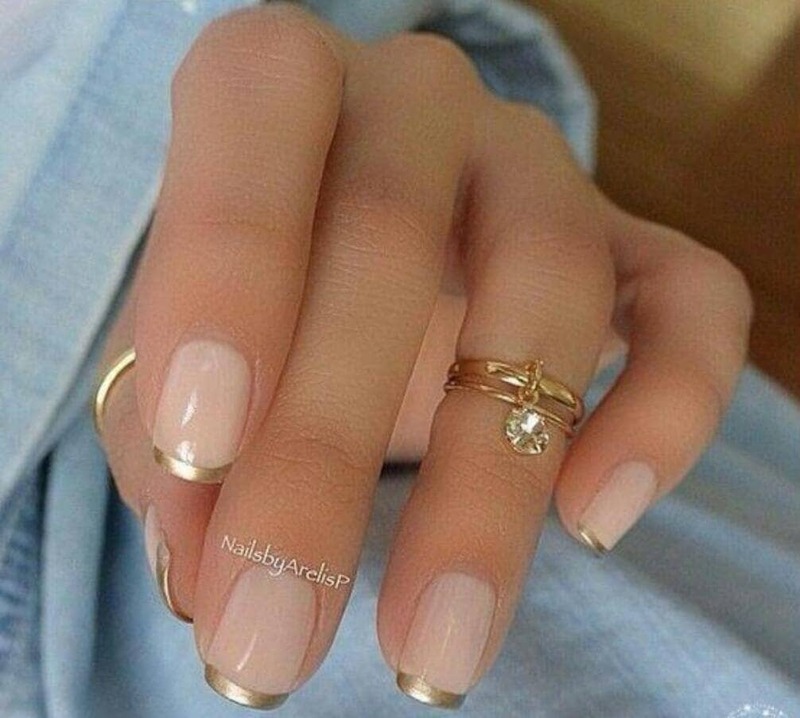 The beauty of this short nail design is in its simplicity. For a fresh take, you could put on a different shade of pastel polish as the base and try other metallics at the tip, like green and silver. These classy pale blue French tip nails are accented by silver metallic polish. They provide a nice contrast to all the pink and white French tip manicures out there. 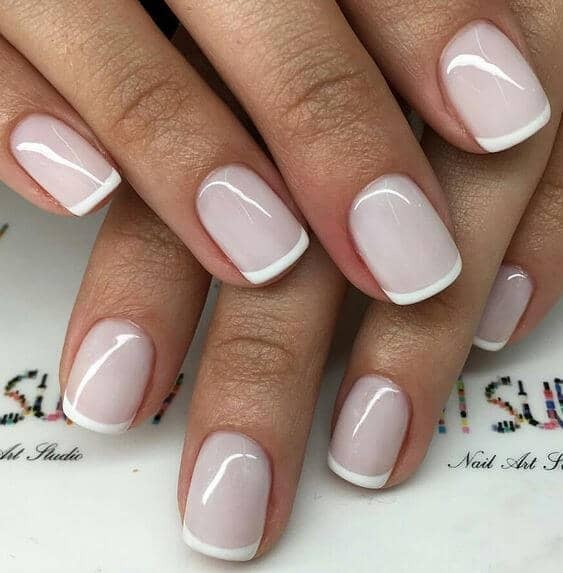 This manicure would be great for someone who wants the classic French look but is ready for a different color to shake things up a bit. 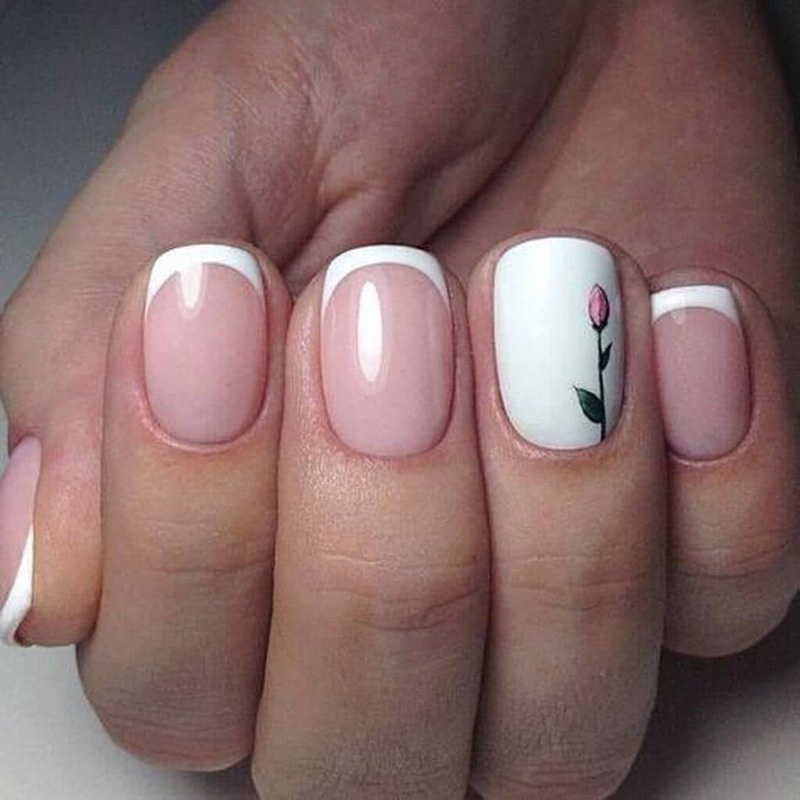 This pink and white nail design has beautiful blush nail polish with soft white tips. The ring fingernail is accented with a matte glittery finish. 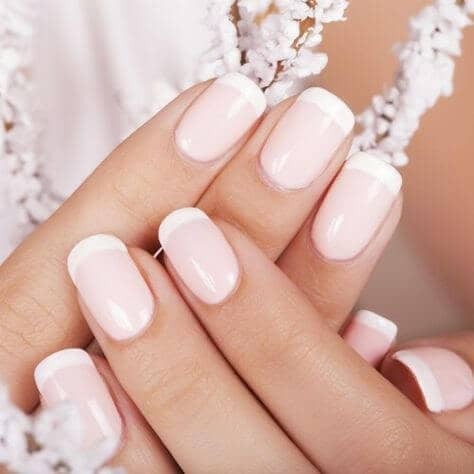 This look is perfect for anyone who wants to give the traditional pink and white French manicure a bit of a twist. It is subtle enough to be great for work or a formal occasion. 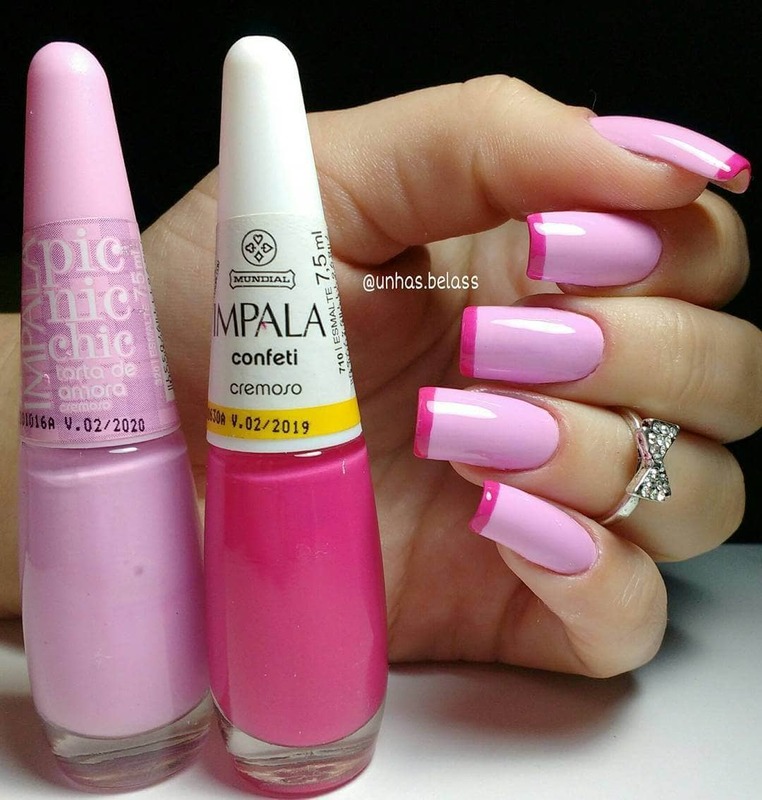 Gorgeous candy pink nail polish blends into white tips with smooth, skillful ombré shading. 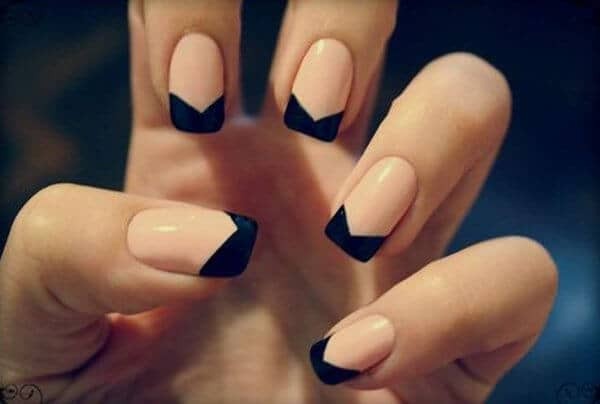 This twist on the traditional French tip nails matches up with the latest trends. Ombré polish isn’t easy to pull off, but with some practice, you can do it at home. Try this look with a flirty sundress. This is one of the cuter nail art designs out there. A classic French tip manicure covers four out of the five nails. The ring fingernail is painted white, and a sweet pink tulip is painted on. Try mixing different nail designs together, like painted nail art with French nail elements. This tulip is simple enough so that the home nail artist should be able to reproduce it. Starting with a coat of soft and glossy pale pink, these nails have delicate white tips. Each ring fingernail is accented at the base with beautiful crystals. These natural nails are cut square at the ends. This would not be too difficult to pull off at home with some tweezers and a bit of patience. These French manicure nails combine a perfect coat of gray matte polish with awesome gold chrome tips. This is one of the more creative nail ideas out there, as these colors are not often paired together. This manicure is dramatic and will get you noticed. These nails would be great for a dressy occasion or with an edgy outfit. This understated look combines a subtle pink nail color with white tips. This gradient or ombré manicure requires a lot of practice to get right. In a “squoval” shape, these nails are practical for everyday wear. They look especially elegant with bridal jewelry and would be a sweet touch for your special day. 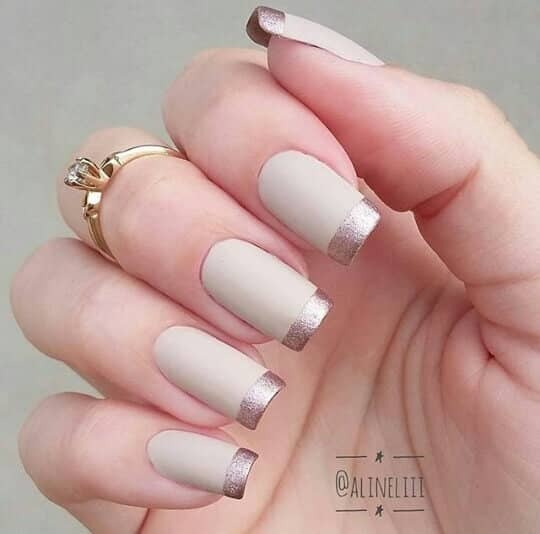 These nails are done in a cool and neutral pale gray. They have perfectly applied white tips. 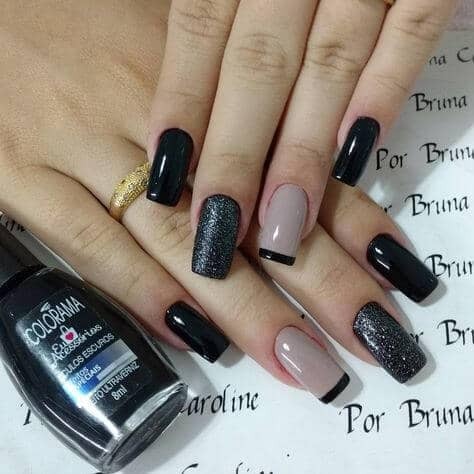 These nails are cut in the practical “squoval” shape. This color combination is unique and can be worn with more conservative outfits while bringing an updated sense of fashion to your look. 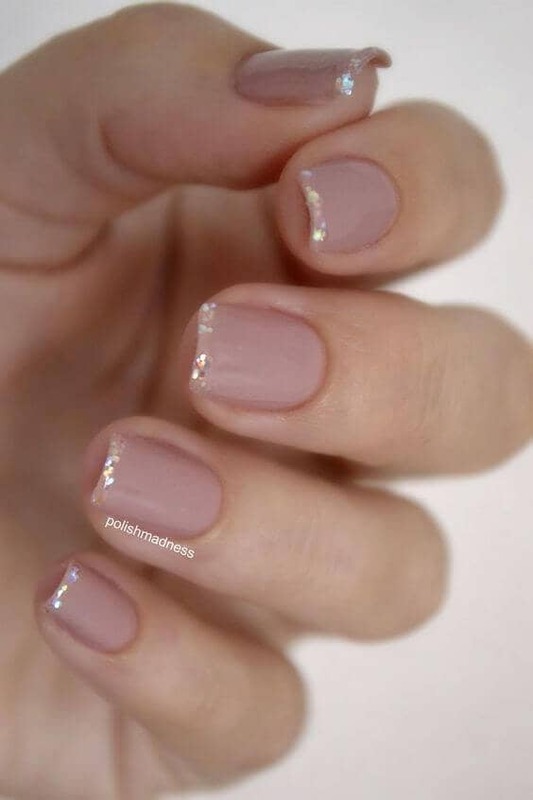 These cute nails have a coat of pale mauve polish with a narrow line of silver glitter painted just at the tips. This is a pretty and subtle way to wear glitter without being too flashy. This fun-loving manicure will complement your outfit and give you a little sparkle where it’s needed. When adding embellishments to your nails, it’s fun to go all out and wear them on every finger. For those who would rather take a more understated approach, try putting them on just one finger on each hand. 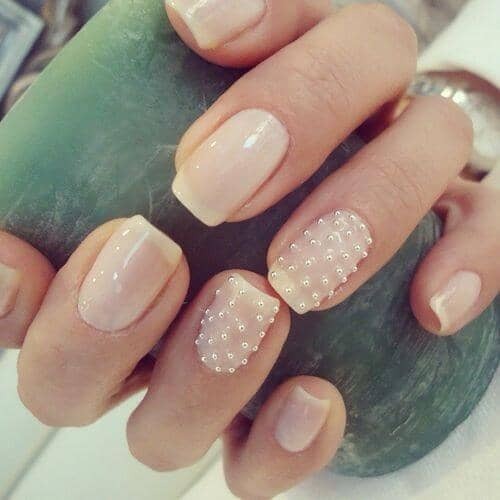 On a smooth coat of pale blush pink, these nails are studded with tiny pearls. This gives the nails dimension and shine. This natural looking manicure starts with a glossy coat of clear polish. The tips are squared off in a “squoval” shape and are done in a bright white polish. On the ring fingernail, a hand-painted design of fanciful swirls takes center stage. The swirls have a touch of glitter for a fun and elegant look. This look combines a few popular nail ideas into a new design. All the nails except the ring finger are done in a light bubblegum pink with a graceful white French tip. 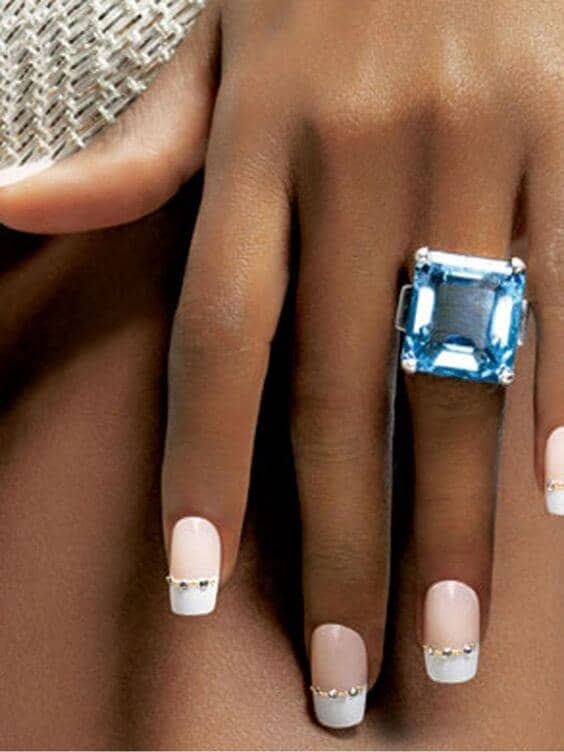 The ring fingernails are not painted in the French style. One of the fingers has an iridescent white polish and the other a gleaming pink. Combining types of polish gives a pleasing contrast. 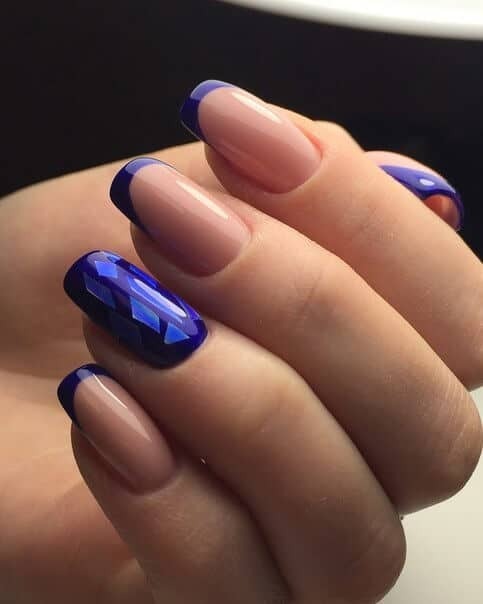 This manicure combines two different nail designs in one. All the nails except the ring finger have a matte white polish. The tips are done in a gold glitter with large pieces. The big pieces of glitter give the effect of gold nuggets. The ring fingernail is done all over with the gold glitter. You can’t go wrong with the classics. This traditional manicure has a glossy coat of delicate pink polish. The tips are done in a perfect white. The nails have a natural shape. These nails are understated and perfect for work or any formal occasion. Anyone would look pretty with this manicure. 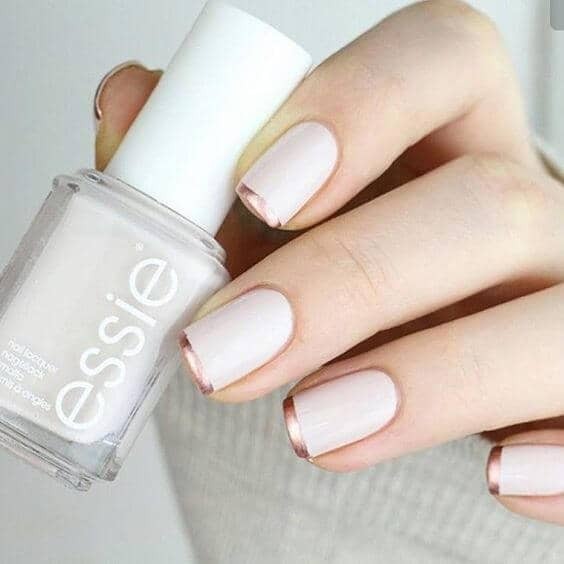 Choosing such a pale pink color as the base of these nails gives the manicure a subtle and beautiful look. The tips are a smooth and glossy white. 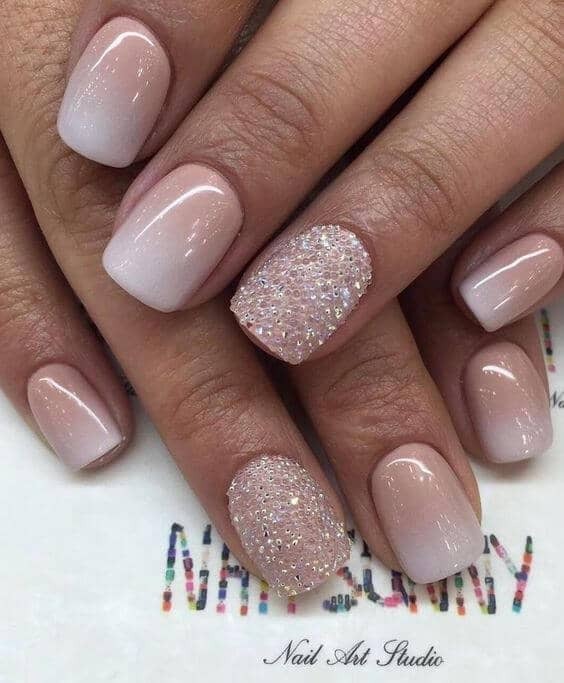 This manicure is gorgeous and understated. It would be a perfect bridal look for anyone who has a traditional sense of style. 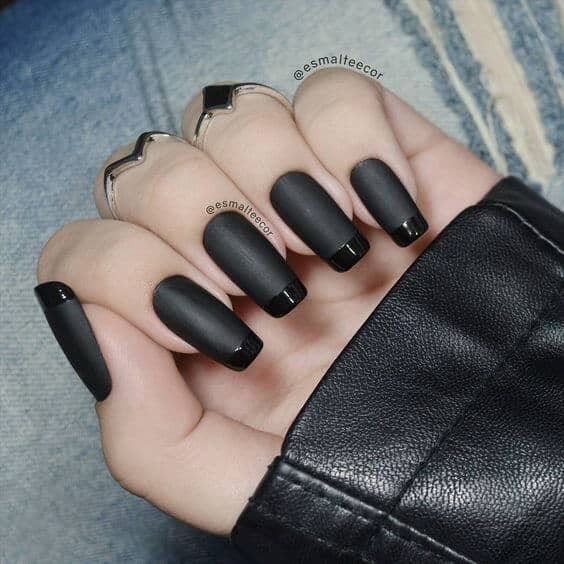 This unique black nail design is for people who want to make an impression. 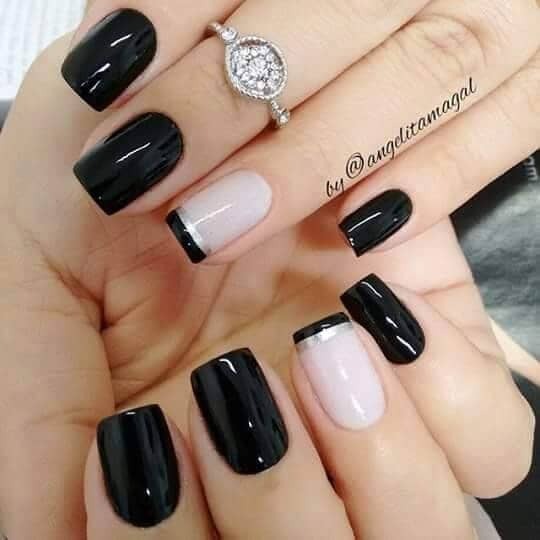 All the nails except the ring finger have a gorgeous, glossy coat of purest black. The ring fingernails have a coat of subtle grayish white. The tips have a stripe of black and a stripe of metallic silver. The contrast between the matte polish and the metallic pinkish silver tips makes this manicure stand out. Matte polish gives this manicure a different look than most of the French tip designs out there. 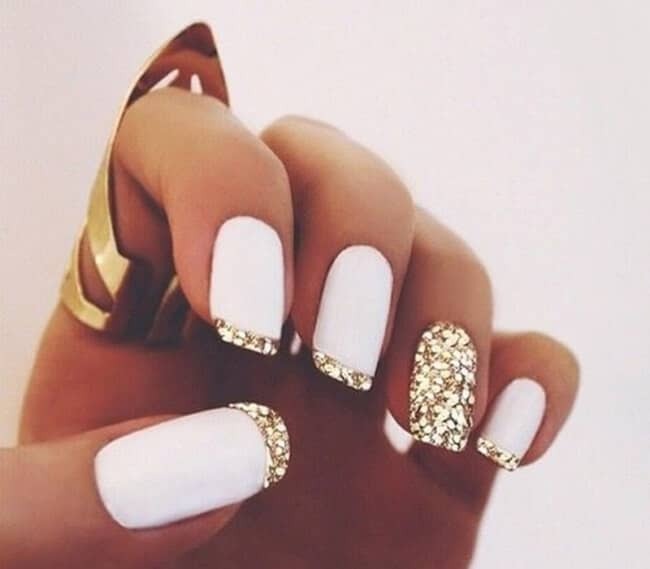 These nails look very nice with gold and diamond jewelry. Try this look if you want to shake up your usual conservative manicure. 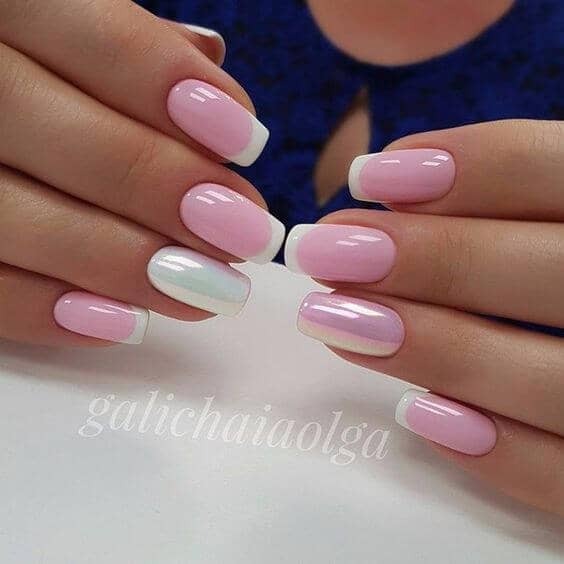 This popular ombré manicure is done in iridescent pink and white. The iridescent quality of the polish makes these nails gleam with beauty. This look is like a gorgeous pearl necklace for your fingers. Try it for a bridal look, or wear it every day to give your outfit a delicate shine. These nails are done in a coat of glossy peach with splashy black French tips. The painted tips come to a point to set them apart from the usual French nail design. This bold look is ideal for anyone who wants to make a big impression. The colors are neutral but the design is not. 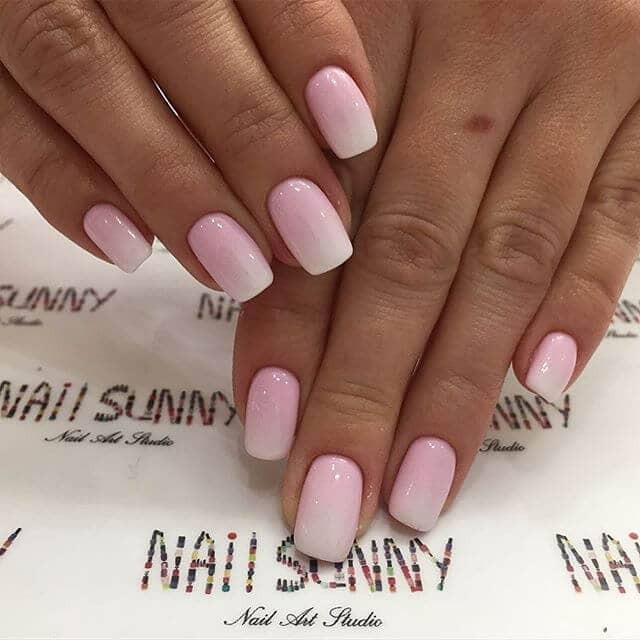 This popular look has a pink and white ombré design. The pink polish is so pale, it’s hard to detect where the white actually begins. This fantastic look flatters everyone. It would be ideal for the finishing touch to a bridal gown, or it could be worn with just about anything. 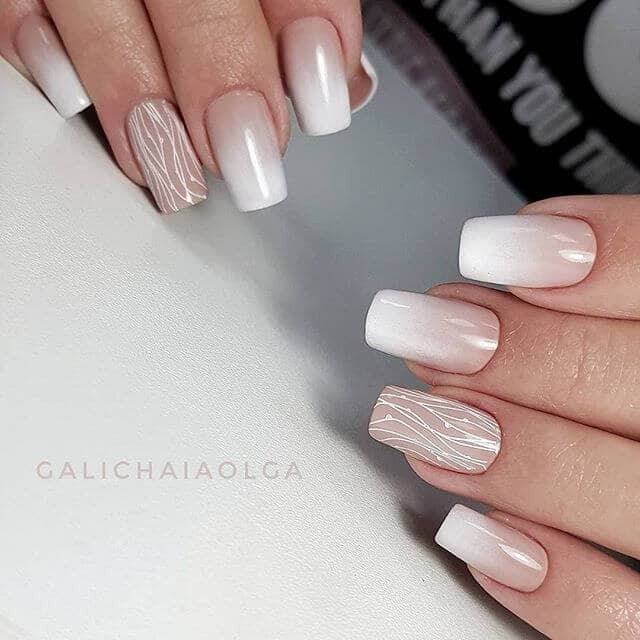 A twist on the manicure above features a delicate pale peach polish and white tips. The glossy peach and white colors are skillfully blended. This subtle manicure is great with any outfit. It gives anyone’s daily look a lift of color and style. These nails are worn a little longer for a fashion-forward impression. This look starts with dusty peach and white in an ombré style. The nails have more white than peach for a twist on the usual French tip manicure. On the ring fingernails, there is an intricate hand-painted design with fine white lines. These lines fall in gentle waves. It would take a great deal of skill to hand-paint a design like this one. These nails start with an overall perfect coat of black matte polish. The tips are done in glossy black for an appealing contrast. These nails are worn a little longer for dramatic effect. This manicure makes the punk rocker in anyone shine through. Wear them with black leather and silver jewelry. This unique look starts with a coat of glossy peach polish. The tips are done in a gorgeous deep purple. The ring fingernail is covered with the purple polish. The nail artist has laid Mylar bits between coats of polish for an extra dimension of cool. These nails add a touch of fun and whimsy to anyone’s look. Rose gold is a hot color right now. These nails take advantage of this trend. With an overall coat of dusty pink, the base color of these nails complements the rose gold metallic tips. Tone on tone color like this is a fashion-forward look for anyone to try. The contrast between the glossy base coat and the metallic tips makes this look special. 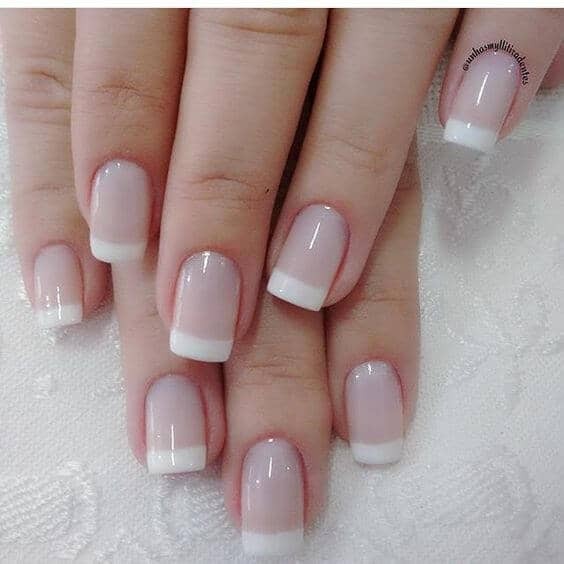 These nails are done in a perfect, natural looking French tip design. These nails are worn in short, practical ovals. On the half-moon of the nails, the artist has painted a semi-circle of glitter. This sets the look apart from the traditional style. 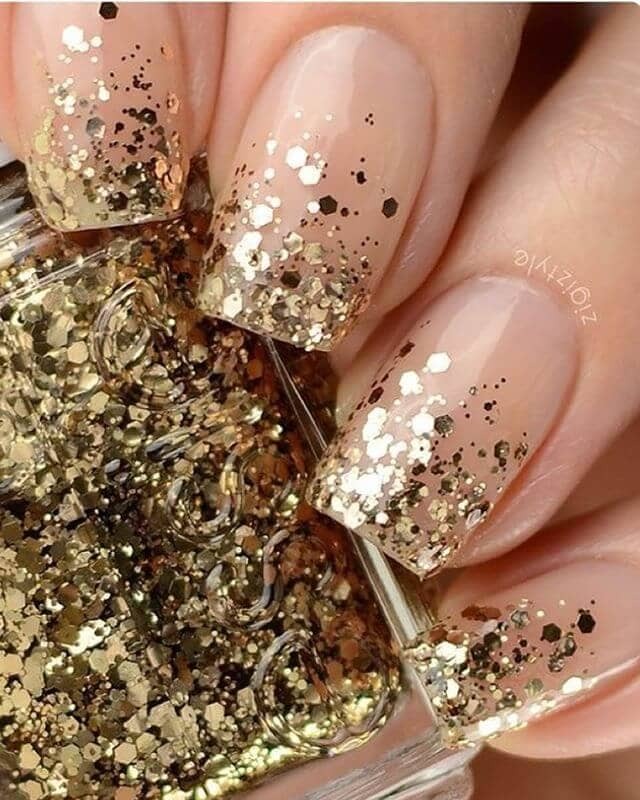 This would be an easy way for anyone who doesn’t normally wear glitter nails to try the look. These nails have a coat of clear polish to start with, allowing the natural color of the nail to shine through. The tips are done in a variety of hot tropical shades, from hot pink to canary yellow. This would be an awesome look for a vacation or a summer day. This subtle look has a coat of glossy peach polish to start with. The tips are done in sky blue with just a hint of glitter for dimension and style. This fun-loving look works with any kind of outfit, from casual to dressy. If your favorite color is sky blue, try this look today. 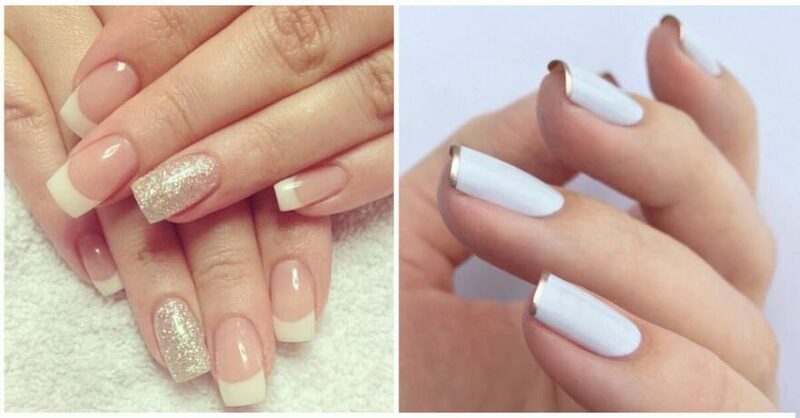 These French tip manicure ideas range from the traditional to the new. Some of the best ideas take the classic pink and white manicure and shake it up with colors and textures of polish. French tip manicures look great on everyone. There are ideas to blend subtly into an outfit as well as those that are meant to draw a lot of attention. Most of these manicure ideas wouldn’t be too difficult to try at home, but you could bring these photos to your favorite nail artist and recreate any of these looks.